In Singapore with a sling, drinking a Singapore Sling. The first point of call for those who want a Singaporean experience in London is a pilgrimage to Westminster Abbey. There, in the north choir aisle, you can find a seated marble statue of Sir Stamford Raffles who founded the colony in 1819. Although a legendary figure in Singapore itself , Raffles incurred the displeasure of his employers, the East India Company, and died in London in relative penury at the age of 44. You can also visit his actual grave in the church of St Mary’s in Hendon, where a carving on the stone floor identifies the burial spot. Singapore has a well-earned reputation as a gourmand’s paradise and its citizens are fanatical about food. Yet, there seems to be surprisingly little argument among its London expat community about where to sample the best Singaporean dishes in the capital. The Bugis Street Brasserie at the Millennium Hotel in Gloucester Road is rightly said to serve the best Singapore food outside Asia: try the Taste of Singapore Set Menu for a quick introduction. At the cheaper end of the spectrum, The Hare and Tortoise in various locations is also a restaurant with an extensive Singaporean menu. Its distinctive Char Kway Teow (a rice noodle dish with Chinese sausage) is a particular favourite of London Singaporeans. The best accompaniment for the light, spicy Oriental mix that is Singaporean food is, of course, Tiger Beer which is brewed in the city-state but found everywhere in London. As for a cocktail you could try its most famous alcoholic export: the strikingly pink and flavoursome Singapore Sling. Alas, it requires dedication to find a Sling in London nowadays. I have asked for it in bars from Shoreditch to Soho and have received concoctions that range from a passable imitation of a Sling to a mojito in disguise. 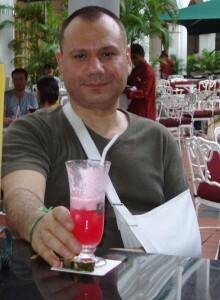 So, I end with a plea: if anyone knows of a London bar that serves a good Singapore Sling, please let me know. 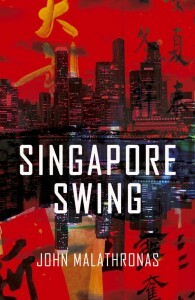 John Malathronas’s travelogue Singapore Swing is available on Amazon. This article was first written for Visit Britain.